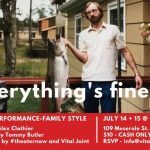 Buy Tickets for Everything’s Fine! Everything’s Fine! comes to NYC – two nights only! An extemporaneous exploration of family and memory, Everything’s Fine! is an entertaining event full of secrets, laughter, and snacks. Co-founded in 2011 by Artistic Director Tommy Butler and Producing Director Emilia LaPenta, #theaternow nurtures and supports emerging theater artists living and creating in the tri-state area; providing artists a platform on which they can experiment, gain firsthand experience, take on leadership roles, and develop an artistic aesthetic. With a specific focus on long-term collaboration, #theaternow creates event-theater presentations by working closely with an artist-in-residence over an extended period of time, often developing and sharing work over the course of multiple years. 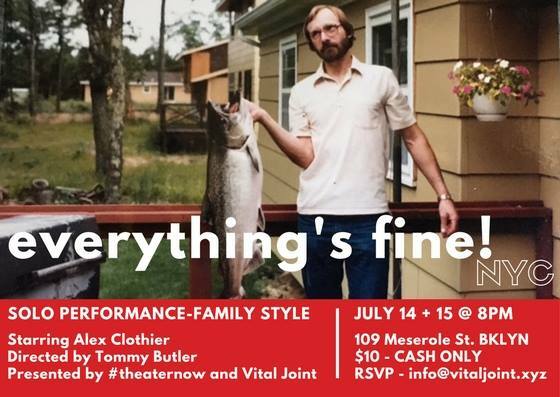 #theaternow’s current artist-in-residence is Alex Clothier (Everything’s Fine!, DC Mentro Arts staff pick, favorite performance of 2016).